"Can I refill your eggnog for you? Get you something to eat? Drive you out to the middle of nowhere and leave you for dead?" It's pretty rare for a second sequel to be superior to the original film, and even rarer for such a sequel to wind up as a full-fledged classic. But that's certainly the case with this holiday favorite, the followup to 1983's Vacation, which introduced the long-running series featuring Chevy Chase and his endless efforts to have a good vacation with his family. But while there was a rapid decline in quality over the rest of the series (still running direct to video, Chase having long ago abandoned ship), the third entry stands as the best of the lot, and is still endlessly funny after multiple viewings. Hapless Clark Griswold (Chase) is determined to give his family, wife Ellen (Beverly D'Angelo), daughter Audrey (Juliette Lewis) and son Rocky (Johnny Galecki) an old-fashioned family Christmas. But between the stress of having all the relations show up on the doorstep—including demented trailer trash Cousin Eddie (Randy Quaid) and his family—and everything inevitably going badly. It doesn't help that Clark has overextended himself financially, relying on his Christmas bonus, which hasn't shown up. From the hunt for the perfect Christmas tree in the snow, to overzealous lighting, to a disastrous Christmas dinner, Clark tries to go to excessive lengths, with predictable and hilarious results. The various situations inherent in the story give Chase ample opportunity to make the most of his skill for physical comedy; he was seldom better than in the sequence in which he's trying to staple lights to the roof, getting himself in a creative series of predicaments. His earnestness plays beautifully off the determinedly whacked demeanor of Quaid, one third con man, one third rube and one third as disgusting as humanly possible. The humor has a tendency to be juvenile and appalling, and that juxtaposition with Christmas sentiment really makes it all the more laughter-inducing. How can you not like a holiday movie that features a dog all-too-appropriately named "Snots?" At the same time, much of the humor is very character driven, giving this more heart and emotional content than any of the others in the series (or for that matter, any other National Lampoon offering). As weird and antagonistic as the family is, there is an affection underneath it all somewhere, and a tacit acknowledgment that like it or not you have to deal with these people and get through the holidays one way or another. It doesn't hurt at all that a marvelous cast was assembled in support, from E.G. Marshall as the cranky father-in-law to Mae Questel (the original Betty Boop) as dotty Aunt Bethany, who recites the Pledge of Allegiance as her effort at saying Grace over the dinner. Tightly paced for the most part, Christmas Vacation also takes short breathers, such as when Clark gets locked in the attic and winds up wistfully watching old home movies (ludicrously dressed in women's clothing to keep from freezing to death). John Hughes' excellent script has a jelly center to its cynical exterior (best personified by the trendy neighbors, played by Nicholas Guest and Julia Louis-Dreyfus), and the result is a wonderful confection that holds up decades later. It's become a holiday tradition in many homes, and the movie still inspires a warm feeling and plenty of laughter. And if that's not enough, you can always enjoy the SWAT team crashing into the house for the finale. Image Transfer Review: Christmas Vacation has always received fairly substandard treatment on DVD, starting off with a pan & scan version that was the only option for far too long, and a rather muddy widescreen version years later. That's all remedied by the HD version, which looks as good as it did when the film was out in theaters. There's plenty of grain, but it's very well rendered and filmlike. Detail is present that I've never seen before, and colors are excellent (most notably Chase's red robe, which is a chroma nightmare on standard DVD). Don't expect a sharp video edge, but that isn't a reasonable expectation with this movie. The animated opening credits are very sharp, with no aliasing or artifacting of any kind. Leaps and bounds ahead of any prior home version, this is one to be very happy with. Audio Transfer Review: The English 2.0 DD+ track is reasonably clean. The soundtrack is marvelous, with plenty of songs crossing the decades. Range on the music is very good with decent but not overpowering bass (though items such as Gene Autry's Here Comes Santa Claus are obviously limited by the source material). Directionality is modest, but there's a decent front soundstage. It's not flashy but it gets the job done. Extras Review: Besides an anamorphic widescreen theatrical trailer, the only extra is a commentary that sports some of the cast and crew. It's a chatty and good-natured affair, but not terribly informative for the most part (though I did learn that Randy Quaid is related to Gene Autry). There are far too many gaps and a lot of narration or comments from the director like "This is location...this is process...this is location." It's pretty skippable. 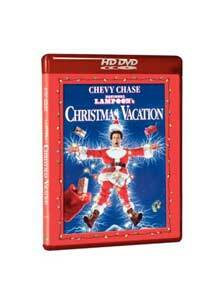 An instant Christmas classic that just gets better and better with time, finally getting a good transfer on HD. Highly recommended.